Until now, I have never endorsed any commercial product, despite the fact that I have been approached many times in the last 20 years. Quite simply, nothing was good enough. 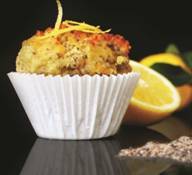 But now I am advising a new UK start-up, Ugg Foods, to produce a range of bread, cake and muffin ready-mixes. They are based on recipes developed by my wife Nicole, and which conform 100 % to our way of eating. Stavroula even sells the safe ‘sugar’ xylitol which is used by Nicole solely in her new developed recipes in the soon to be published book PALEO HARVEST.